Modern global financial institutions offer clients a variety of services, ranging from investment banking to equities trading, that are conducted by different divisions or business segments of each financial institution. 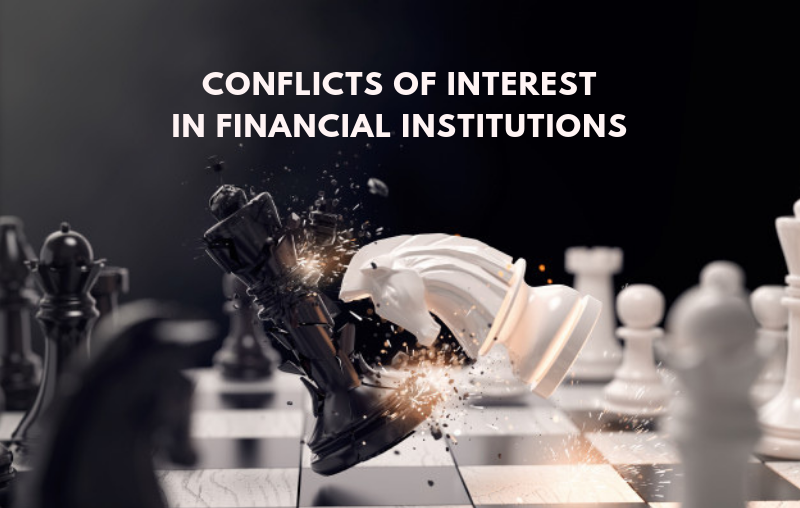 Consequently, as the breadth of a financial institution’s duties expands, the risk of conflicts of interest arising increases. Investment banks gain economies of scale and scope, by providing financial services that tackle informational asymmetries in the primary and secondary capital markets. They combine a large variety of activities that include the floatation of new and seasoned securities, advising on mergers and acquisitions, serving as brokers or dealers, the provision of research, and making markets. Recall that ﬁnancial intermediaries produce information and achieve economies of scope by providing multiple ﬁnancial services (banking, underwriting, and insurance) to their customers. However, economies of scope in information production may lead to potential problem: conﬂicts of interest. Conﬂict of interest is a type of moral hazard problem that arises when an institution has multiple objectives and, as a result, has conﬂicts between those objectives which may potentially lead to conceal information or disseminate misleading information. Conflicts of interest, in the context of the relationship between a financial institution and its client, are a breach of the fiduciary duties owed by the financial institution to the client. A fiduciary relationship is a special category of legal relationship where one party agrees to act in the sole interests of the other party to the exclusion of their own interests. Banks, acting as intermediaries between borrowers and lenders (depositors) can be thought of as engaging in two principal-agent relationships – one with its borrowers where it acts as principal and one with its depositors where it acts as agent. As an intermediary, a bank wears two hats and necessarily finds itself in competing and potentially compromising relationships. Why Do We Care About Conflicts of Interest? Other than problems of moral hazard and ethics, conflicts of interest can substantially reduce the quality of information in financial markets, thereby increasing asymmetric information problems. In turn, asymmetric information prevents financial markets from channelling funds into the most productive investment opportunities and causes financial markets and the economy to become less efficient. Investment banks perform two tasks: They research corporations issuing securities, and they underwrite these securities by selling them to the public on behalf of the issuing corporation. Investment banks often combine research and underwriting because the information synergies created may lead to economies of scope. A conflict of interest arises between research and underwriting because the investment bank attempts to serve the needs of two client groups—the firms for which it is issuing the securities and the investors to whom it sells these securities. These client groups have different information needs: Issuers benefit from optimistic research, whereas investors desire unbiased research. Due to economies of scope, however, both groups will receive the same information. When the potential revenues from underwriting greatly exceed brokerage commissions, the investment bank has a strong incentive to alter the information provided to both types of clients, so as to favour the issuing firms’ needs. If the information provided is not favourable to the issuing firm, it might take its business to a competitor that is willing to put out more positive information and thereby entice more people to buy the newly issued stock. Authorities that regulate investment banking, such as the Financial Conduct Authority (FCA) in the UK and the SEC in the United States, require that banks impose a “Chinese wall” to prevent communication between investment banking on one side and equity research and trading on the other. Critics say such a barrier does not always exist in practice, however. Investment banks use effective information barriers as a means of managing potential or actual conflicts of interest. These information barriers prevent information passing from one part of our business to another. In general, effective information barriers between the parts of business that act for corporates/issuers, and the parts of business that act for investors in those corporates need to be respected. Where the organisational arrangements do not manage a conflict adequately, they operate an escalation policy to ensure that a conflict is properly assessed and managed by, for example, disclosure or declining to act. Since investment banks engage heavily in trading for their own account, there is always the temptation for them to engage in some form of front-running – the illegal practice whereby a broker executes orders for their own account before filling orders previously submitted by their customers, thereby benefiting from any changes in prices induced by those orders. Ratings are widely used by investors as a guide to the creditworthiness of the issuers of debt. As such, they play a major role in the pricing of debt securities and in the regulatory process. Conflicts of interest can arise from the fact that there are multiple users of ratings; and, at least in the short term, their interests can diverge. Investors and regulators are interested in a well-researched, impartial assessment of credit quality; the issuers in a favorable rating. Because issuers pay to have their securities rated, there is a fear that credit agencies may bias their ratings upwards in order to get more business. A further concern is that rating agencies have begun to provide ancillary consulting services. Rating agencies are increasingly asked to advise on the structuring of debt issues, usually to help secure a favorable rating. In this case, the credit-rating agency would be in the position of ‘auditing its own work’ raising conflicts of interest similar to those in accounting firms when they provide both auditing and consulting services. Furthermore, providing consulting services creates additional incentives for the rating agencies to deliver more favorable ratings in order to further their consulting business. The possible reduction in the quality of credit assessment by rating agencies could then increase asymmetric information in financial markets, thereby reducing their ability to allocate credit. The traditional role of an auditor has been to act as an efficient monitor of the quality of information produced by firms so as to reduce the inevitable information asymmetry between the firm’s managers and other stakeholders, especially its suppliers of capital. In auditing, threats to truthful reporting arise from several potential conflicts of interest. The conflict that has received the most attention lately occurs when an accounting firm, as well as providing audit services, also provides non-audit consulting services – tax advice, accounting, management information systems, and strategic advice, commonly referred to as management advisory services (MAS). These multiple services enjoy economies of scale and scope but create two potential sources of conflict of interest. The most commonly discussed conflict is the potential to pressure auditors to bias their judgements and opinions to limit any loss of fees in the ‘other’ services. The second more subtle conflict is that auditors often evaluate systems or tax and financial structures that were put in place by their non-audit counterparts within the firm. Both conflicts may lead to biased audits, with the result that less information is available in financial markets, which will make it harder for them to efficiently allocate capital. Although commercial banks, investment banks and insurance companies originally arose as distinct financial institutions, there were economies of scope that could be attained by their combination, thus leading to the development of universal banking in which all of these activities are combined in one organization. Yet, given that activities within a universal bank serve multiple clients, there are many potential conflicts of interest. If the potential revenues from one department surge, there will be an incentive for employees in that department to distort information to the advantage of their clients and the profit of their department. For example, issuers served by the underwriting department will benefit from aggressive sales to customers of the bank, while these customers are hoping to get unbiased investment advice. A bank with a loan to a firm whose credit or bankruptcy risk has increased, has private knowledge that may encourage it to use the bank’s underwriting department to sell bonds to the unsuspecting public, thereby paying off the loan and earning a fee. A bank may make loans on overly favorable terms in order to obtain fees from activities like underwriting securities. To sell its insurance products, a bank may try to influence or coerce a borrowing or investing customer. All of these conflicts of interest may lead to a decrease in accurate information production by the universal bank, thereby hindering its ability to promote efficient credit allocation. In summary, we have seen that investment banks are fraught with a host of conflicts of interest, some wholly contained within the bank and others that exist on a broader scale.